Just as any little girl would be, Trot is immensely curious of mermaids. Her friend, the old Captain Bill, insists that mermaids are dangerously beautiful creatures who pull land-mortals deep into the ocean, with no hope of escape. No one who sees a mermaid, lives to tell the tale, he says. But the young girl isn’t convinced. She’s quite positive that lovely creatures like mermaids are incapable of any harm. She ardently wishes to see a mermaid and learn more about them. And lo! her wish comes true (much to the old Captain’s chagrin)! A couple of exquisitely beautiful mermaids grace a visit as the Captain and Trot are out boating. They invite the little girl to their magic palace under the deep sea to learn more about them and their ways of life. Using their magic, both Trot and the Captain are given elegant “fish-tails” to swim! Trot plunges into the deep sea to go through a magical adventure, where she learns about the mermaids, the sea creatures, and even braves a nasty encounter with Zog, the evil sea monster. How I sorely wish I were Trot! 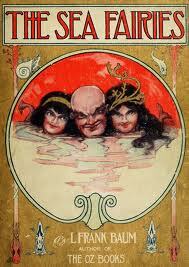 Frank Baum is a popular children’s fantasy writer, most famous for his Oz series of books. Who doesn’t love the Oz series?! Combine such a well acclaimed writer, and a story about mermaids and adventure under the sea, and viola comes out a book whipped just for me :). I'm glad to find one more person who loves fantasy tales :).